The pyrotechnic slowing-down composition on the basis of the modified mixture consisting of polymer and powder of metal, ammonium nitrate, an epoxide resin and chromate of barium is developed. In the development of recipes composition is determined the ratio between the oxidant and fuel, which could provide the stable combustion at low speed. Barium chromate was introduced into composition as the retarder and to reduce the burning rate. The resulting delay composition has a low sensitivity to friction and shock, do not require special storage and special vehicles for transportation, it has a high physical and chemical stability. The gas generator equipped with this delaying composition most suitable for processing bottom-hole zones of oil and uranium wells. It is shown that using methods of mechanochemical modification of components of heterogeneous condensed systems, it is possible to influence actively process of their combustion and to increase their effectiveness and completeness of use. One of the promising directions for creation competitive products in the field of pyrotechnics and in manufacture of products of defense and national economic importance is modification of components. Components modification allows have a significant impact on their properties and on the compositions characteristics on their basis. Nowadays the mechanical grinding with mechanical destruction of polymers is widely used for the processing of polymeric waste in order to give them a second life in new polymer products [1-3]. The mechano destruction of polymers is followed usually by the release of volatile products recorded by the chromatographic and mass spectrometric methods. Transfer reactions of a neutron and disintegration of secondary radicals are characteristic of a mechanodestruction of some polymers. At resilient deformation of polymer, the probability of disintegration of secondary radical’s increases appears a possibility of development of destruction by a chain mechanism [4-5]. Modified polymer composites are used to improve the properties of delay compositions. Pyrotechnic delaying formulations are intended for providing time delays in pyrotechnics for various purposes, pyrotechnic automatics system rocket and space technology, ammunition, industrial means of initiation, an electric slow motion [6-10], they are also widely used for equip fusing devices and delay nodes means of initiation with blasting operations in the mining and coal mining industries [11-15]. In the work was investigated the composition which contains as an oxidizer-barium chromate, an additional oxidizer-powdery ammonium nitrate, and as fuel PET and magnesium, and fuel binding an epoxide resin. The composition was prepared for 100.0 g, formed and subjected to drying at temperature 25°C for 168 h. The composition combustion had been studied in the reactor for burning at atmospheric pressure. Combustion temperature was determined by means of an optical pyrometer. For experimental studies, the samples of delaying formulations were pressed into cardboard cartridges with internal diameter 2.6 cm and 10.0 cm in height with a hydraulic press tool in a few pressings to achieve a uniform charge density. Mechanochemical modification was performed in an apparatus capable of providing effects of hit or abrading (ball mill) to substance or mixture of substances. Activation of processes of chemical interaction of a surface of the modified component and the modifier happened at hit of particles of these substances in the zone of action of milling bodies or devices [16,17]. The positive moment of this process is that mechanical influence is followed by intensive stirring. In this work, the mixture of magnesium powder and PET are subjected to the mechanochemical treatment [18,19]. The obtained modified powders are compacted to a compaction factor of 0.9 in the samples of 15.0 mm in a diameter, who then booked the side and one end surface. Activity of metal was studied by a gas-volumetric method, by measuring the volume of released hydrogen at interaction of the reactant with an active metal powder. The polymer content was determined gravimetrically after dissolving a modified metal-polymer mixture in a hot solution of hydrochloric acid at 1:1. The main criteria for assessing the behavior of the system were selected surface area and the rate of combustion, as a characteristic that gives enough objective information about the nature of the place in the system processes. The burning rate of samples was determined by the results of photometry. Modification of polymers allows regulating properties of products in the widest range of applications, with producing products with a complex of properties and quality, necessary consumers which correspond to the modern world level . In this work, the results of studies on the effect of solid-phase mechanochemical modification (SPMCM) of magnesium powder mixture with polyethylene terephthalate (PET) are given. The EM researches showed that after activation polymer was on the surface of metal in the form of a film, as if enveloping it (Figure. 1). Figure 1: A microphotograph of particles of magnesium powder, covered with polymer (at different zoom (magnification): a-1000, b-5000. For comparison, the tests results have been carried with starting mixtures, that is, without a mechano-chemical modification. The results of the study are given inFigure. 2. 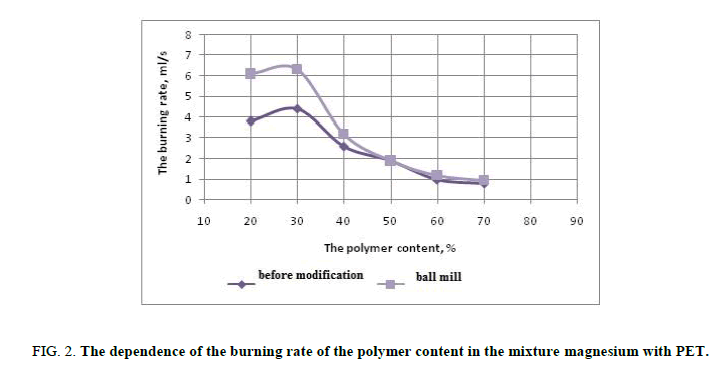 Figure 2: The dependence of the burning rate of the polymer content in the mixture magnesium with PET. Data indicated that burning rate of the modified mixtures is higher than burning rate of the not modified mixtures. The maximum change in speed and concentration limits occurs in the processing of magnesium and PET mixture. The burning rate at the maximum increases in 0.8-1.2 times, the concentration limits are expanded from 18.0%-25.0% to 5.0%-60.0% PET after vibro processing. On dependence, it is also visible that the maxima of burning rate of the modified PET mixtures are shifted relative to the original mixture. This shift can be attributed to the fact that the modification occurs during a modification ratio of components. Such shift can be explained with the fact that in the course of modification there is some change of a ratio of components. The analysis showed that after processing of magnesium mixture with 10.0% of PET the quantity of components concerning the initial mixture was changed. Changing the content of magnesium is due to its oxidation by air oxygen and mechanical destruction products of PET. It is known , that thermal destruction of PET takes place in a temperature range of 290°C-310°C. Destruction occurs statistically along the polymer chain; major volatile products are terephthalic acid, acetaldehyde and carbon monoxide. At 900°C a large number of different hydrocarbons is generated; mainly volatile products consist of carbon dioxide, carbon monoxide and methane. Besides a breaking the main chain of macromolecules under mechanical influence also can rupture chemical cross-links in the reticulate polymer structures. Here mechanical destruction leads to the formation of fragments of reticulate structures, which are already can be dissolved in solvents of polymers . Considering similarity thermo and mechanodestructions, it is possible to assume that decrease of burning rate of the modified mixtures on the basis of a magnesium and PET when using a vibration mill is caused by oxidation of metal fuel, i.e., mechanodestruction products at a rupture of a side chain of polymer. It can be assumed that the overall increase in the burning rate is a consequence of complex processes occurring during SPMCM, in particular, such factors as the particle size reduction (at low polymer content), the polymer mechanical destruction (decrease in molecular weight) and formation of "a film" of the polymer on the magnesium particles surface (decrease in the diffusion barrier at the thermal conversion). Thus, the mechanochemical treatment of mixtures of a magnesium and poly (ethylene terephthalate) leads in general to increase in burning rate of mixtures and expansion of concentration limits of their combustibility (Figure. 3). Next, the obtaining mixture was introduced into delaying composition based on ammonium nitrate, epoxy resins, barium chromate. When developing compounding of formulation was defined such ratio between an oxidizer and fuel at which steady combustion with a small speed and a high precision in confined volume was reached. Thus, the ratio of the formulation components was determined (Table 1). Figure 3: Combustion of delaying composition. Table 1. Ratio of the composition components. Combustion of composition was followed by bright lighting effect, reaction took place energetically. Time of combustion was equal to 207 sec. Temperature of process of combustion was 2200°C. In the Figure. 4a and b the pores and cambers on a surface are visible, temperature increase causes thermal decomposition of organic compounds in a mixture and, therefore, the amount of pores and cambers increases. Figure 4: SEM microgragh of delaying composition after burning (at different zoom (magnification): a-1,000, b-15,000. Experimental studies confirmed the choice as combustible and at the same time binding the epoxide resin which is thermoset. The contact method of determination of temperature revealed flash point of composition which is equal to 320°C. Thus, as a result of researches the optimum composition based on a modified PET and a mixture of magnesium ammonium nitrate, epoxy resins and barium chromate was chosen, burning duration, of which was 207 seconds at a height of 10 cm. Duration of composition combustion was 2,070 seconds on height of 1 m. The gas generator equipped with this delaying composition most suitable for processing bottom-hole zones of oil and uranium wells. The developed formulation has a low sensitivity to friction and shock, does not require special storage and special vehicles for transportation. It can be prepared at the site of works, safe in manufacturing and handling at all stages, has high physical and chemical stability. Ren H, Jiao QJ, Chen SC. Mixing Si and carbon nanotubes by a method of ball-milling and its application to pyrotechnic delay composition. J Phy Chem Sol. 2010;71:145-8. Beck MW, Brown ME. Modification of the burning rate of antimony/potassium permanganate pyrotechnic delay compositions. Combust Flame. 1986;66:67-75. Tichapondwa SM, Focke WW, Fabbro OD, et al. Calcium sulfate as a possible oxidant in “green” silicon?based pyrotechnic time delay compositions. Propellants Explos Pyrotech. 2015;40:518-25. Kalombo L, Fabbro OD, Conradie C, et al. Sb6O13 and Bi2O3 as oxidants for Si in pyrotechnic time delay compositions. Propellants Explos Pyrotech. 2007;32:454-60. Swanepoel D, Fabbro OD, Focke WW. 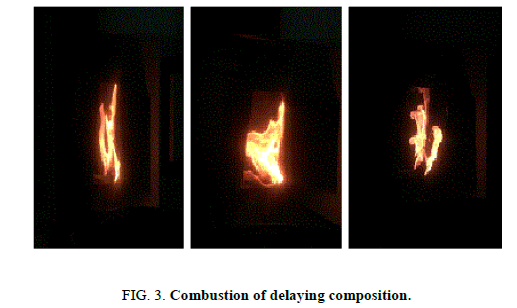 Manganese as fuel in slow?burning pyrotechnic time delay compositions. Propellants Explos Pyrotech.. 2010;35:105-13. Kang X, Yang F, Luo J, et al. Thermal-ignition and combustion behavior of pyrotechnic composition containing mechanically activated commercial Mg-Al alloy. Combust Sci Technol. 2015;187:963-75. Boddington T, Cottrell A, Laye PG. A numerical model of combustion in gasless pyrotechnic systems. Combust Flame. 1989;76:63-9. Redkar AS, Mujumdar VA, Singh SN. Study on magnesium based pyrotechnic composition as a priming charge. Def Sci J. 1996;46:41-7. Chen X, Zhao J, Pan GP, et al. 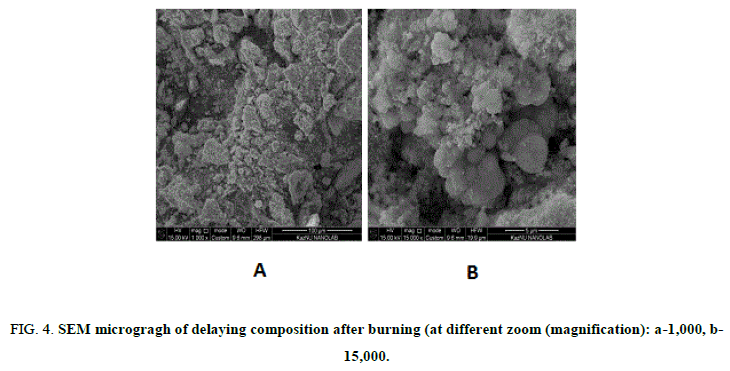 Experimental study of PTFE powder size impact to Mg/PTFE pyrotechnic composition. Adv Mat Res. 2012;463:281-5. Montgomery YC, Focke WW, Atanasova M, et al. Propellants Explos Pyrotech. 2016. Lu KT, Yang CC, Ko YH. investigation of the burning properties of slow?propagation tungsten type delay compositions. Propellants Explos Pyrotech. 2008;33:219-26. Sarawadekar RG, Jayaraman S. Def Sci J. 1992;42: 177-181. Solov’ev VO, Patsyuk VV, Klochko EA. Inhibiting pyrotechnic compositions for new means of initiation. J Machinery Manufacture and Reliability. 2015;44:609-15. Xing Q, Du Zh, Zhao L, et al. Procedia Eng. 2012;45: 552-557. Baiseitov DA, Gabdrashova SE, Magazova AN, et al. Hydrogenation of coal of "Karazhira" field: Optimal catalysts and thermogravimetric researches. Int J Chem Sci. 2016;14:244-50. Baiseitov DA, Gabdrashova SE, Akylbai AK, et al. Obtaining of liquid fuel from coal in the presence of the polymers. Int J Chem Sci. 2016;14:261-8. Baiseitov DA, Tulepov MI, Sassykova LR, et al. The sorbents for collection of oil and petroleum of the phytogenesis. Int J Chem Sci. 2015;13:1027-33. Sassykova LR, Massenova AT, Gilmundinov SA, et al. DGMK Tagungsbericht.2014;3:181-188. Yao M, Chen L, Yu J, et al. Thermoanalytical investigation on pyrotechnic mixtures containing Mg-Al alloy powder and barium nitrate. Procedia Engineering. 2012;45:567-73. Yong LV, Campanella G. A study of blast characteristics of several primary explosives and pyrotechnic compositions. Journal of hazardous materials. J Haz Mat. 1989;21:125-33. Tichapondwa SM, Focke WW, Fabbro O, et al. Comparative Study of Si-BaSO4 and Si-CaSO4 Pyrotechnic Time-Delay Compositions. J Ener Mat. 2016;34:342-56.